HTC has announced two new smartphones in its Desire series named Desire 12 and Desire 12+. 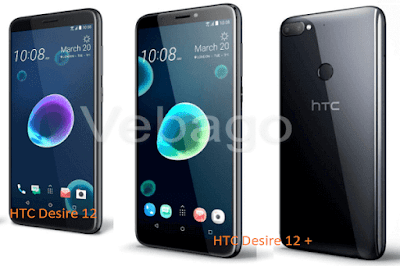 The HTC Desire 12 and Desire 12+ comes in Black, Gold, Silver, and Purple colors. The smartphones will go on sale starting from April in Europe. The smartphone packs a 13MP rear camera with f/2.2 aperture, PDAF, LED Flash, BSI sensor, 1080p video recording and a 5MP selfie camera with f/2.4 aperture. It comes with 2GB/3GB RAM and 16GB/32GB storage, which can be expandable up to 2TB of storage. It has a 5.5-inch 18:9 HD+ 2.5D curved glass display with a resolution of 1440 × 720 pixels. The device measures 148.5 x 70.8 x 8.2 mm and Weighs 137g. The HTC Desire 12 runs on Android 7.0 Nougat OS with HTC Sense UI. The smartphone is powered by a 1.5GHz Quad-Core MediaTek MT6739 64-bit processor with PowerVR Rogue GE8100 GPU. There is a battery of 2730mAh. The Dual SIM smartphone supports 4G VoLTE and has connectivity options like Wi-Fi 802.11 a/b/g/n, Bluetooth v4.2, GPS + GLONASS. A 1.8GHz Octa-Core Snapdragon 450 processor powers the smartphone with Adreno 506 GPU and it comes with a 6-inch HD+ 18:9 2.5D curved glass display with a resolution of 1440 × 720 pixels. The device measures 158.2 x 76.6 x 8.4 mm and Weighs 157.5g. The HTC Desire 12+ sports a 3GB RAM and 32GB storage, expandable memory up to 2TB. The Dual SIM smartphone runs on Android 8.0 Oreo with HTC Sense UI and has a Fingerprint sensor on the back of the phone. The device sports a 13MP + 2MP dual rear camera for capturing beautiful images and an 8MP front-facing camera for selfies. Connectivity options on the smartphone include 4G VoLTE, Wi-Fi 802.11 a/b/g/n, Bluetooth v4.2, GPS + GLONASS and powered by a 2965mAh battery.